What is a Ground Cover Plant? In landscaping, the term ground covers usually refers to any one of a group of low-lying plants with a creeping, spreading habit that are used to cover sections of ground while requiring minimal maintenance. It is also possible to use standard landscape ornamentals as a ground cover. Low-maintenance perennials such as daylily, for example, can be used to cover large expanses or slopes. Typically, a ground cover plant is some form of low-growing ornamental perennial plant, but there are also some creeping shrubs that can serve this function, as well as ornamental grasses or self-seeding annuals. Ground cover plants are often chosen for aesthetic considerations, such as to introduce new colors or textures into a landscape. Or, they can be chosen for practical purposes to cover ground where turf grass does not thrive or is not practical. 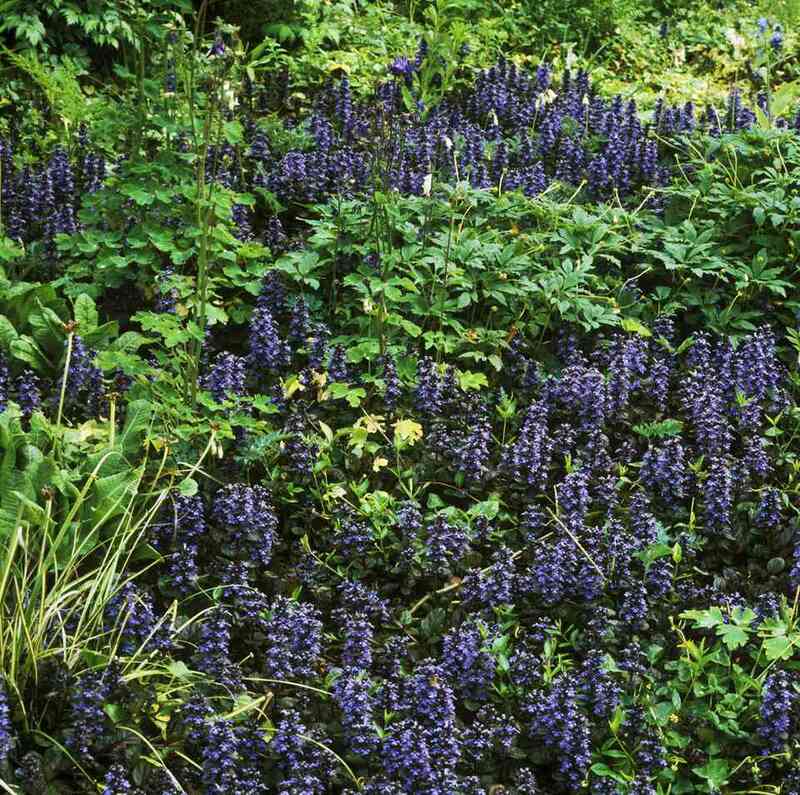 For example, areas of a yard that are deeply shaded may be a good spot for an alternative shade-tolerant ground cover plant, such as ajuga or pachysandra. Steep slopes that are difficult to mow may also be a good area to plant a ground cover. In arid climates where the high-water demands of grass are problematic, an alternative ground cover may replace grass entirely. When covering large expanses of ground on the landscape, the initial cost will be much greater than for sowing grass seed, but ground covers may save you money in the long run, since they eliminate expenses such as extensive feeding, watering, and lawnmower fuel and maintenance. Distinction Between "Ground Cover" and "Cover Crop"
The term ground cover should not be confused with cover crop. These are different groups of plants, despite some overlap. A cover crop is a plant that is used as a kind of living mulch, usually in vegetable gardening or commercial food production. A cover crop is usually an annual plant that is planted in a garden or field and is intended to grow for a season and then be tilled under in order to add nutrients to the soil. Ground covers, on the other hand, are ornamental perennial plants that are intended to cover an area of ground for many years. To covering slopes where mowing can be difficult with grass. Low-growing shrubs, such as 'Blue Rug' juniper can work well here, as can low-maintenance perennial creeping plants. For large slopes, daylily makes a good ground cover. To cover shady areas where turf grasses don't grow well. A variety of shade-loving, spreading plants are suitable to this purpose. As covers for intensely hot, dry areas. Choose arid-climate plants such as ice plant or sedum (stonecrop) for these locations. For extremely high-traffic areas that don't bear up well when planted with grass. Instead, try a sturdy creeping plant such as baby's tears (Soleirolia soleirolii) or creeping thyme (Thymus serpyllum) in these locations. To choke out weeds. Some ground covers grow dense enough that they block out weeds. Creeping phlox (Phlox stolonifera or P. subulata) or dragon's blood sedum are some examples. To create fragrance. A ground cover of creeping thyme or one of the creeping mint species can introduce delightful smells into a landscape and may serve to attract bees and other pollinators. Do You Grow Any Plants That Are "Mighty Fine Specimens?"